• Indications for aesthetic inlays and onlays versus direct restorations or crowns. When do we chose onlays? Onlays and endodontically treated teeth. • Materials for inlays-onlays: Ceramic options versus indirect composite. • Step by step preparations for onlays. Required burs. • Predictable Impressions: Materials and technique. • Step by step temporaries for onlays. • Step by step technique and materials required. Upon satisfactory completion of this Seminar & Workshop Course, participants will be awarded with 14 CPD Certified hours. Marianna Kontopodi graduated from Dental School of the Aristotle University of Thessaloniki in 2005. September of the same year she moved to England where she worked as a general dentist in private practice in Brighton and London. In 2006 she continued her studies at New York University, College of Dentistry and completed her Masters in Aesthetic Dentistry in July, 2008. September of the same year she moved to London, where in addition to her work as an aesthetic dentist she worked as a guest lecturer with Eastman Dental Institute, (UCL) in the field of cosmetic dentistry. Since 2010, Marianna Kontopodi lives and works in Athens and Crete and participating as a lecturer at seminars in Aesthetic dentistry in Greece and abroad. 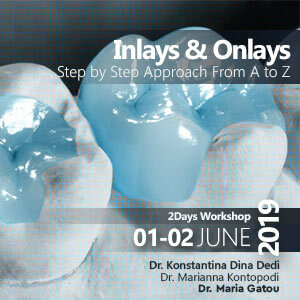 Treatment Planning for Inlays-Onlays, Indications, Materials and their properties (What to use, what NOT to use), Step by step preparations and required armamentarium. Pulp protection in deep restorations. Impressions, impression materials and technique. Temporisation: Materials and temporary fabrication and fit. Preparations for inlays-onlays. Impressions. Temporaries. Fit and Cementation of Onlays(Two protocols). Treatment Planning Exercise of Two Challenging Cases. Stay informed about dental news through newsletters.